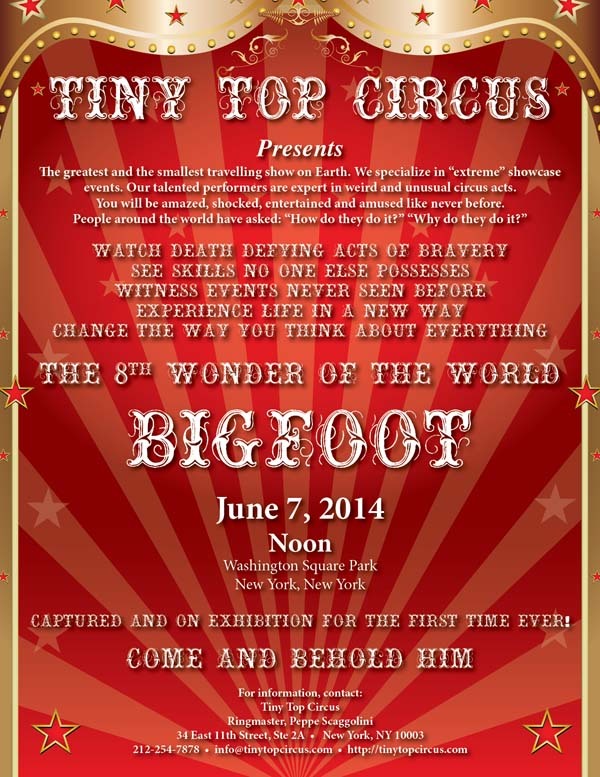 Peppe Scaggolini (aka Joey Skaggs), Ringmaster of the Tiny Top Circus, the world’s only pataphysical circus, featuring “the greatest and the smallest traveling show on earth,” announced the capture and imminent exhibition of Bigfoot in New York City. Known for its strange and gifted performers expert in unusual acts of bravery and skill, Tiny Top Circus had prepared a circus performance guaranteed to amaze, shock and entertain. The date was set for June 7, 2014 in Washington Square Park. 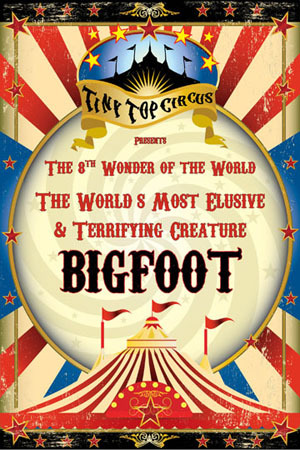 The performance went off as planned, with Bigfoot safely in his cage in the mobile circus tent. A $10 million dollar reward was offered for his safe return. 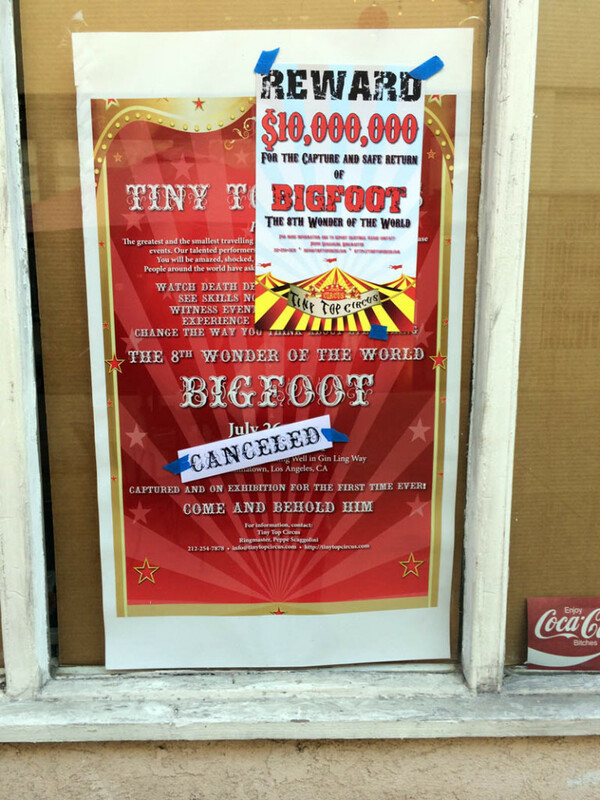 Citizens were warned to be on alert as Mayor Bill de Blasio and the NYPD opened an investigation, hoping to find Bigfoot before someone got hurt. While on the lamb, Bigfoot was sighted here, here, here and here. 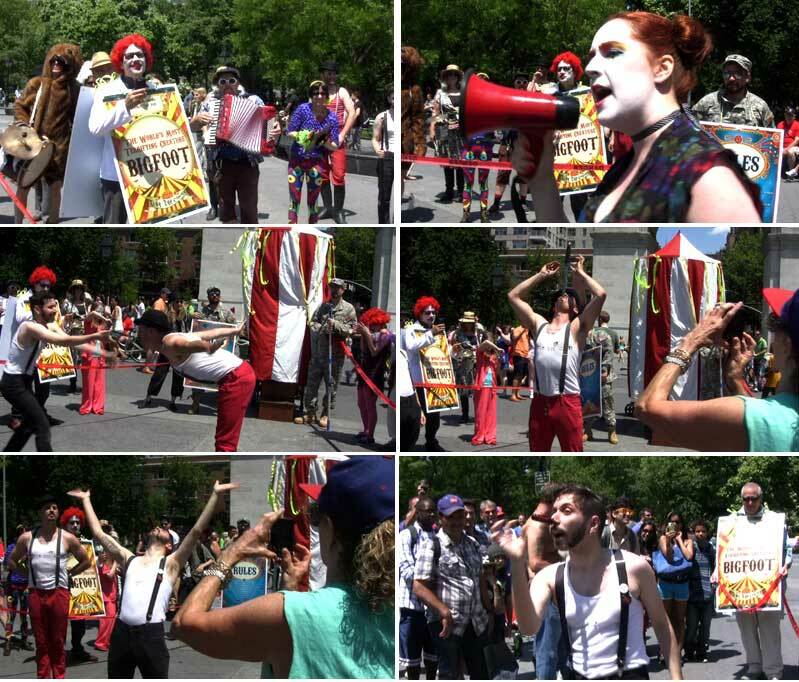 He then amazingly returned, on his own, and traveled with the Tiny Top Circus to Los Angeles to appear during the Perform Chinatown: Chaos Reigns festival on July 26, 2014. While there, he escaped again. The reward, which had been rescinded, was reinstated. The whole story plus downloadable circus posters are on the Tiny Top Circus website.